According to a 2015 study in PLOS ONE, the punitive state targets the most marginalized groups of people, and this has nothing to do with higher crime rates. Rather, people are criminalized because of racial and class discrimination. Numerous reports have shown that you are more likely to be arrested and incarcerated if you are poor, undocumented, black, trans, queer and/or disabled. The police are almost never charged and convicted for use of force. Of the 1,147 people killed by police in 2017, officers were charged with a crime in only 13 of these cases. 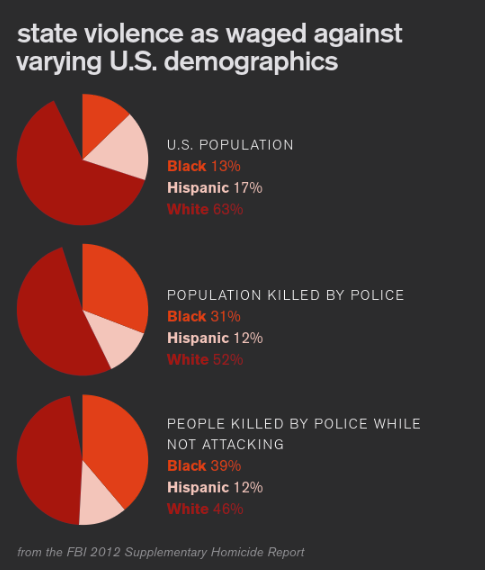 That’s one percent of all killings by police. And according to policeviolencereport.org, most of these killings took place in response to suspected non-violent offenses or cases where no crime was reported. Government statistics indicate that the largest percentage of people are incarcerated for drug offenses. Meanwhile, pharmaceutical companies and rich people who commit the same crimes are aided and protected by the state. Academic studies show that mass incarceration does not reduce crime. Instead, it is a drain on the economy and taxpayers. If the punitive state were defunded, and state resources were instead used to fund education, employment, drug treatment and rehabilitation services, it’s likely that crime would go down drastically.